It's been a while, but here we are again with another Let's Brew Wednesday. And it's on a Wednesday! The gods must be smiling. Starkey Knight & Ford was a large regional brewery in the Southwest of England, which operated breweries at Bridgwater in Somerset and Tiverton in Devon. When it was bought by Whitbread in 1962 it had 400 tied house. The Brigwater closed immediately, but the one in Tiverton remained open until 1982*. Which means it was around when I was drinking. Though, as it brewed no cask, I never tried its beers. Milk Stout was all the rage between the wars. It was helped by two trends: from draught to bottled and for sweeter, less alcoholic beers. Mackeson, the first Milk Stout first appeared before WW I, but really took off in the 1920's and spawned mnay imitators. It's incredible popularity amongst a specific generation - Brown Ale experienced something similar - inevitably led to becoming as popular as flared trousers and long hair a a punk gig. It became associated with pensioners - not exactly the role model teenagers starteing to drink would be looking to. I can remember Mackeson being advertised on the TV in the 1960's and possibly the 1970's: "It looks good, it tastes good and by golly it does you good!" They don't write slogans like that any more. Because it breaks all sorts of rules. This beer has all the usual features of the style: a decent gravity, but poor attenuation, a very dark colour and a healthy dose of sweetness from the lactose. Note that the lactose is added in the copper. That wasn't the way Whitbread brewed Mackeson. That was essentially their Extra Stout recipe with the lactose added at racking time. Thanks to Boak and Bailey for providing the phot of the breweing record on which this recipe is based. That's me done, so over to Kristen . 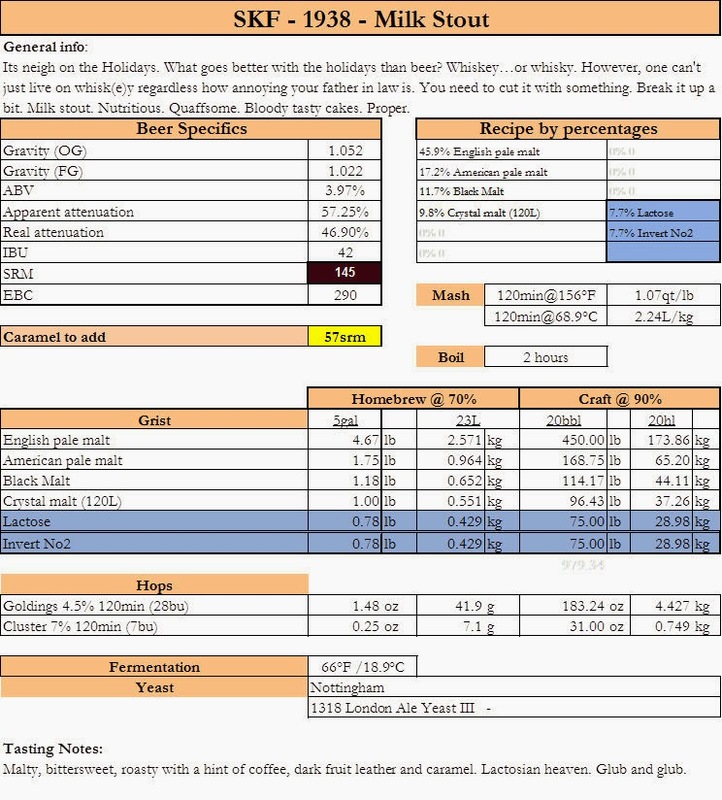 . . . .
Notes: Probably the most simple milk stout you could do. Its very high finishing gravity is nearly reminiscent of back sweetened and pasteurized versions. Seeing this thing is only around 4%, and the lactose only really accounts for about 5 gravity points there are a lot to make up for. Three (3) days fermentation from 61F to 67F and then back down again seems they controlled the fermentation by chilling it. As soon as they hit the 1.022 they dropped the temp to 59F which would pretty much kill the ferment. They high mash temp as well invert would help to add to the high final gravity but its mostly ferment control….which might be hard for some of you. If that’s the case, I’d up the lactose quiet a bit. Basically do your calculations for making a beer 4% and then add back the lactose. Meaning something like use the same malt by percent as in the recipe (save lactose) for something like a 1.038 aiming to finishing at 1.008. For my milk stouts I never include lactose in the calculations but add it after the boil in the whirlpool at a set amount. If you start somewhere around 30g/L, in the whirlpool, and go from there, I think you’ll find your milk stouts turn out much better. I like mine higher but that is based on the amount of roast malts I have in the beer. For this beer, if you start at 30g/L lactose in the boil, you’ll be good regardless if you change the gravity of the recipe or not. Malt: Two pale malts, a dark crystal, some black malt and then the lactose. The only little difference you see is the addition of the dark invert and also caramel. Carmaline to be precise. Go ahead and leave out the caramel as I don’t think its going to make a single ounce of difference to the final product. I suggest No2 invert and don’t really think the No3 would help. You have quite a lot of black malt (13%) so don’t really need any more darker flavors. No2 hits the sweet spot pretty well. Hops: Hops are pretty straightforward and lend just enough bitterness to keep this baby from being cloying. A few goldings and some Cluster. Pick your poison. I tend toward the lower AA% hops regardless of origin. Yeast: So this is a milk stout, one with a ton of non-fermentables so it really doesn’t matter what yeast you use. However, I really like the London III. Just so silky and smooth. Really smooth. Smooooooooooth…like a cow with a speech impediment. Moooooooooth. * "The Brewing Industry: a Guide to Historical Records" by Lesley Richmond and Alisson Turton, 1990, page 331. Happy to see one more of these. I'll get brewing! Seem to be great labels. Is it? How old are Christmas beers?